Yesterday was a beautiful Sunday. The air was crisp and cool with a steady slow breeze. The sun was bright, the birds were chirping and the sky was an infinite sea of blue space. Not a single cloud sailed the sky. It was a perfect day to go out and enjoy the outdoors. After breakfast, about nine o’clock my wife and I decided to visit a Hindu Temple about half a mile from our house. 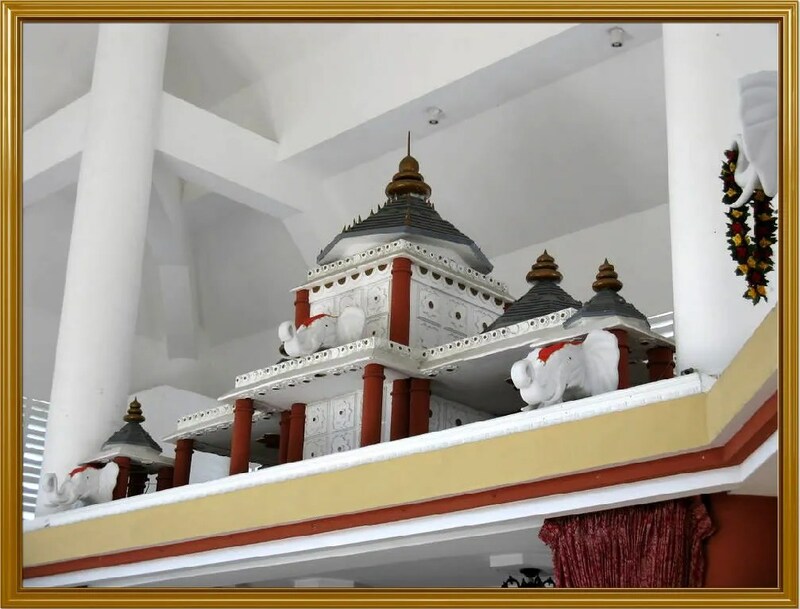 It is the only Hindu Temple in Panama built to assist the modest community of Indian citizens living in Panama. 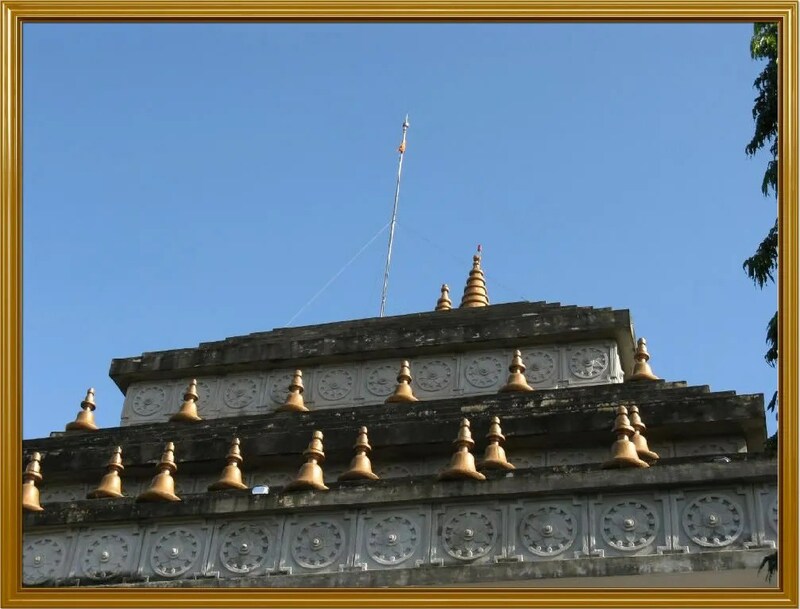 The temple is on top of a hill in Tumba Muerto and has a typical Asian architecture. Panama, because of its historical reliance on commerce, is above all a melting pot. This is shown, for instance, by its considerable population of Afro-Antillean and Chinese origin. There are also communities of Spanish, Italian, Greek, Indian, Jews, Hindus and Muslims. Smaller religious groups include Jewish and Muslim communities with approximately 10,000 members each, and small groups of Hindus, Arabs, Buddhists and Rastafarians. The Hindu population is Panama is a prosperous and respected ethnic group. Many of them are businessmen. They own stores which sell imported Indian merchandise, engage in the sale of used cars and peddle other small-priced goods such as clothes, watches and perfume. They are known for their hard work. As expected, I took my Birthday camera with me and took a few photographs of the temple. This is what I saw. Here we go. 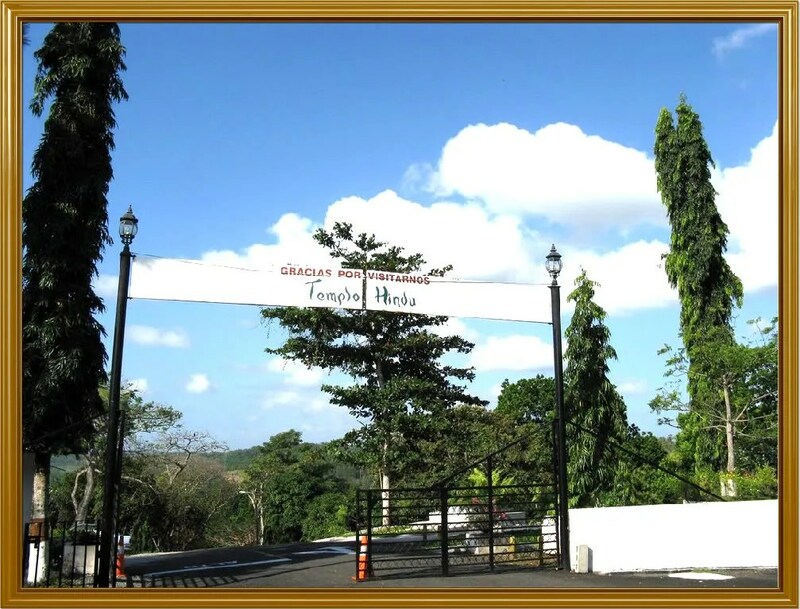 View of the main entrance gate to the premises of the Hindu Temple. The sign reads, “Thank you for visiting us – Hindu Temple”. Notice the lush vegetation around the area of the temple. Panoramic view of the Hindu Temple alongside Tumba Muerto Highway. A close up view of the roof of the temple. Notice the bell-shaped figures and the clean blue sky. Not a single white cloud in sight. View of the different Hindu Gods inside the temple. Hinduism is not a monotheistic religion, they believe in many Gods. Hindu beliefs vary widely, with concepts of God and/or gods with Vishnu and Shiva being the most popular deities. Other notable characteristics include a belief in reincarnation and karma, as well as personal duty, or dharma. View of an elephant on the ceiling of the temple. Elephants play an important part in the Hindu religion. Elephants are an important part of the Hindu religion. 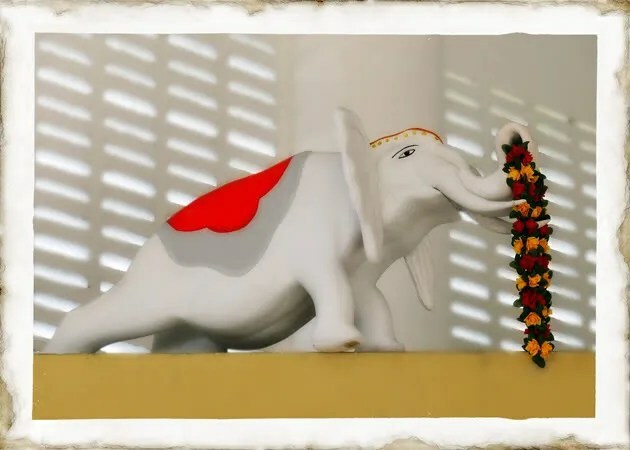 For example, the son of Shiva and Parvati, Ganesha has an elephantine countenance with a curved trunk and big ears, and a huge pot-bellied body of a human being. He is the Lord of success and destroyer of evils and obstacles. He is also worshiped as the god of education, knowledge, wisdom and wealth. In fact, Ganesha is one of the five prime Hindu deities (Brahma, Vishnu, Shiva and Durga being the other four) whose idolatry is glorified as the panchayatana puja. View of the ceiling of the temple just above the main altar where the Hindu deities are aligned. Notice the geometric structures of the building. This is the end of the tour to the Hindu Temple alongside the Tumba Muerto (Ricardo J. Alfaro) Highway in Panama City. I hope you have enjoyed the trip as much as my wife and I did. Good Day. questions or doubts. Hope the next time he comes, you all can go. What a pleasant surprise to read your comments. Thank you for your kind words. I think the Hindu Temple is one of the most beautiful temples in Panama. thank you for your kind words,i want to go panama, how to go plz replay me. The best way is to go to a travel agency in your country. They will give you all the information you need. You will enjoy Panama. 1. Hindus Living in Panama: I don’t have the exact number of Hindus living in Panama. However, I would estimate the ballpark figure is approximately between 3,000 and 5,000 Hindus in the country. Most of them live in Panama City. 2. Tourist Visa: I would suggest you contact a Panamanian Consul in your country to obtain the latest information on this issue. I wouldn’t like to give you outdated information. A travel agency will also be very helpful. 3. Indian Shops and Restaurants: We have many Indian shops and restaurants in Panama City. I’m sure you will find what you are looking for. I suggest you use Google Search for this information on the Internet, since the list can be quite extensive. If you have any problems, let me know. Me gustaría saber si es posible recibir la enseñanza en su templo de un maestro sivaista,a pesar de que me encuentro lejos del templo. Realmente no lo sé. Le recomiendo que se acerque al templo para recibir más información. Yo solamente fuí un visitante que tomó fotografías de este bellísimo templo. 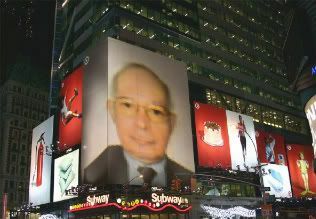 I am a Chinese born American who has moved here to retire with my husband, Alfred, about 3 years ago. As you can see from my website, I am an artist. I am currently working on a series of abstracts and the subject matter is the cultural diversity of the people in Panama. Your blog is very interesting. I would very much like to visit the Hindu Temple. Would it be possible to bring the members of the American Society, to which I belong, together for a visit sometime? Is there a recommended time that would be especially interesting to go? Would someone be able to give us a tour and provide some information? The day I went to shoot the pictures of the temple, there was nobody there, except the Hindu people who came in to pray. It was an early Sunday morning. I apologize, but can’t provide you with further information, other than suggest you visit the site and ask the security guard outside the premises if he can answer your questions. I tried to search the Internet for a phone number, but couldn’t find any. Thank you, Omar. We will pay them a visit and hopefully someone might be there. I’m sure you will find a security guard at the entrance of the temple. I have no doubts he will provide you with the information you are requiring. I’m glad you enjoyed the photographs. I am a hindu girl from Canada, and I am looking to move to Panama for work opportunities. I received my teaching english as a second language certificate because that is the easiest way to start working in a foreign country. I wanted to know if you might know of any schools that I can get connected with? I would like to come to Panama in January and my mom would come help me move there but I would like to have some leads before making such a big move. I would like to live in an area that has some indian people as well so I don’t feel too out of place and safety is most important so maybe you can recommend some specific areas in Panama City that would be good for a single girl? I can’t wait to come visit this mandir once I am there. I appreciate any help you might be able to provide me with. Hi Sonia, did you receved an appropriate response? Do you like to share this on the net? Have a nice day (hopefully) English teacher! and thanks for response. Hi Vijayta, refreshing to see a latest message in 2016 as most postings are years old…I am too interested to visit and may be retire in Panama but no information is coming thru from other readers on this site. Can Jessica or Sonia or PanamaVeggie give more information on this site or to my email to: rickmo004@yahoo.com. Will greatly appreciate a reply. Many thanks for your time and response. If possible please Jessica let me know your email. What I understand you are more active in this market. Thank you. No problem. Glad to help the visiting group. There is a large community of Indians living in Panama City. They speak different languages from their Motherland India, Spanish, English and Spanish. If you visit Panama City, you will have no problem communicating with this community. I speak with them in perfect Spanish and English. They have adapted very well to this country and are involved in several economic endeavors. It’s a very beautiful temple you have in Panama City. I was interested in opening up a salon in Panama City. I live in Chicago. Will i be able to find people of India or Pakistan that know how to perform threading services and if so, how can i reach out to them? In the Name of an hindu from Canada. My wife and I are hindus and would like to travel to panama city. by booking into a hotel is like the blind leading the blind. So great respected hindus we need you help. I’m not involved in the hotel business. I just write a blog about Panama City and its whereabouts as a hobby. I suggest you contact a travel agency in Canada and they will be more than glad to help you find an adequate hotel in Panama City. Hi! I’m a student at Florida State University and I’m doing a research paper on Hinduism. 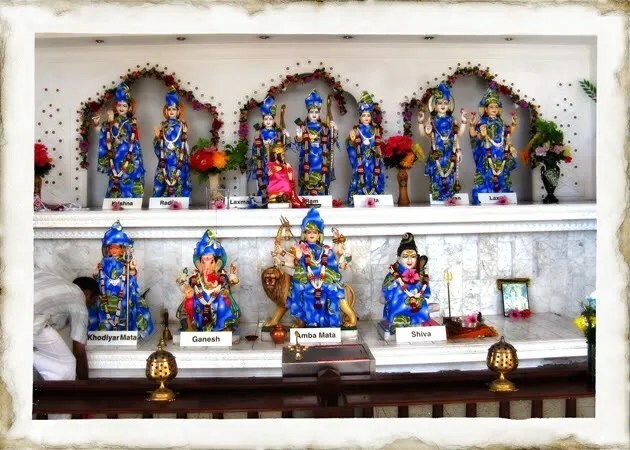 I was wondering if anyone had an email address for the Hindu temple in Panama City? Thanks! Actually, from what I’ve learned in a religion class and at the Hindu Temple in Maple Grove, Minnesota, Hinduism is a monotheistic religion. Hindus believe there is one God, and this God adopts different faces/forms as the times and cultures change. a big thank you for your effort. I very much appreciate your time thanks. No need to stay close to the temple (not a good area, busy city road). Stay in the city and take a cheap taxi to the temple when you want to go. 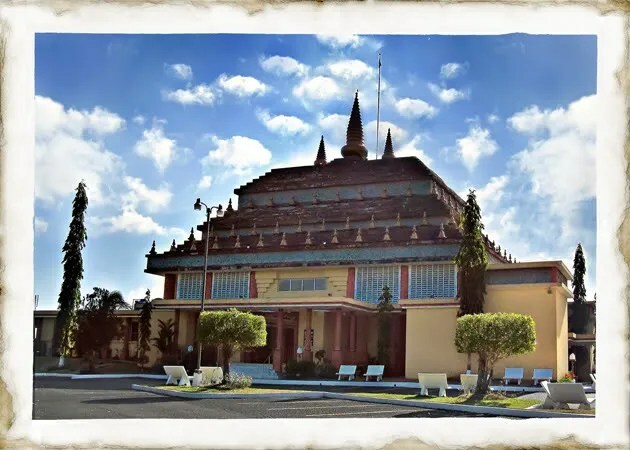 Hola muy lindo el blog, solo que quiero aclarar que tambien existe otro templo hindu en Panama que esta en la ciudad de Colon! Can someone help me please, i don’t speak a word of Spanish. And I am from Malaysia. I am coming to Panama on next Thursday, Can you please put me on to an Indian in Panama. Would really appreciate if it can be done. Please share the information if your received from an indian from Panama. Read your blog and it’s honestly awesome. I am planning to come to Panama, can you guide me different places and Indian cmmunity if there is any?